Abstract: There are many different ways documented for reconstruction of oral and maxillofacial (OMF) region among which the use of flaps (local or distant) is commonly practiced worldwide. Modern techniques of OMF reconstruction aim to restore function as well as improve aesthetics. This article intends to review the literature on varied flaps used in oral and maxillofacial surgery (OMFS) and summarize their precise clinical implications taking into consideration the ease, difficulties, and the ultimate clinical outcomes. A review of the literature of local or distant flaps used in OMFS was done using Google database. There are many different methods of reconstruction in patients who have had defect in the OMF region due to vascular reasons. It is important for the OMF surgeon who is involved with the management of such patients to have an understanding regarding the choice of flap used to reconstruct such defects. Abstract: Bone marrow (BM) examination is an essential tool in evaluation and staging of non-Hodgkin lymphoma (NHL). The aim of this study is to overview the approach to the use of unilateral versus bilateral BM sampling in lymphoproliferative disorders for diagnosis and staging. All cases diagnosed as lymphoproliferative disorders from January 2014 to January 2017 were studied. Bilateral trephine biopsy and aspiration of 414 cases were assessed for involvement patterns and presence/absence of background changes. Bone marrow involvement (BMI) was seen in 109 (26.3%) cases. The cases ranged from 2 to 80 years. BMI was more frequent in B-cell lymphomas than T-cell lymphomas as was the incidence (B-NHL= 87/109 [79.8%]; T-NHL=21/109 [19.1%]). Among B-cell lymphomas, BMI was most frequent in chronic lymphocytic lymphoma followed by B-lymphoblastic lymphoma (BLL) and mantle cell lymphoma. Among T-cell lymphomas, BMI was most frequent in T-lymphoblastic lymphoma (TLL). A single case of anaplastic large cell lymphoma (ALCL) had BMI. Bone marrow aspiration (BMA) and bone marrow trephine (BMT) agreed in 97% of cases (401 of 414: 308 both negative, 93 both positive). Additional 13 cases were diagnosed on BMT whereas BMA was negative for these cases. Background changes (fibrosis and necrosis) were common in TLL followed by BLL. Of the 109 positive cases, 4 were missed by unilateral BMT. Peripheral spill of lymphoma was seen in 14 of 109 cases. BMT involvement by lymphoma is more commonly seen in lymphoblastic lymphoma. Bilateral trephine biopsy remains gold standard to determine the marrow involvement and staging and assess the remission. 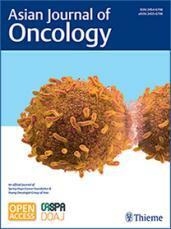 Abstract: Epidermal growth factor receptor–tyrosine kinase inhibitor (EGFR-TKI) is currently the standard therapy for EGFR-mutated non–small cell lung cancer (NSCLC). Gefitinib is the first EGFR-TKI marketed in Indonesia and has been used since 2012 in Dr. Soetomo General Hospital, a tertiary hospital in Surabaya, East Java, Indonesia. Although the drug had shown some positive results, the overall treatment outcome for Indonesian patients has not been reported yet. The aim of the study is to evaluate the progression-free survival (PFS), overall survival (OS), and subjective response of gefitinib as first-line treatment in advanced EGFR-mutated NSCLC patients in Dr. Soetomo General Hospital. This retrospective study includes all eligible patients treated from 2013 to 2016. Demographic data, performance status, tumor histopathologic types, treatment response, and adverse effects (AEs) during the treatment course were collected from patient's medical records. Objective response was based on RECIST 1.1. Quality of life was assessed using Eq. 5D questionnaire. From evaluable data of 63 patients, median PFS was 8.3 months (95% confidence interval [CI: 6.50–10.2) with median OS of 16 months (95% CI: 11.9–20.2). Eq. 5D scores were decreased in 21 (33.3%) patients, stable in 22 (34.9%), and increased in 20 (31.7%). The most common side effects were itchy skin rash in 52 (82%) patients and diarrhea in 29 (46%). Gefitinib as first-line therapy provides a good objective response and is generally well tolerated in patients with EGFR-mutated NSCLC in Dr. Soetomo General Hospital. Abstract: India being the second most populous country in the world accounted for 25% of cervical cancer death according to GLOBOCAN 2012. Although there are many agents available, the need for a model chemotherapy regimen that is effective and at the same time less toxic and has easy affordability is the current unmet need. We devised a study with the most commonly available and affordable drugs such as Cisplatin, 5-Fluorouracil (5FU), and Paclitaxel. The main objective was to study the efficacy of concurrent chemoradiotherapy in treatment of carcinoma cervix, using two different regimens in terms of clinical response evidenced clinically as well as on imaging. Secondary objectives were to assess the progression-free and overall survival. It was clearly evident that the response rate could be appreciated clinically in arm B over A; however, this difference could not be justified by statistical methods. Toxicities observed in both the arms was comparable, and in terms of progression-free and overall survival, the differences were not significant suggesting that the both the options could be considered in the treatment. Although the outcome looks promising prompting exploration of more such combinations that are easily available in the rural hospitals, but because of smaller sample size and smaller follow-up, a multi-institutional study with a larger sample size and a longer follow-up is definitely required to set the ball rolling in favor of combination chemotherapy, including cisplatin and 5FU. Abstract: The histopathological interpretation of a tumor still remains the gold standard for diagnosis and deciding the type of therapy. Furthermore, in the context of chemo-radio-therapies often leading to prominent cytological and stromal changes in the tumor, histopathological interpretation during treatment, thus, becomes all the more important in correctly diagnosing and grading the tumor for an effective and planned regimen of the therapy increasing prognosis and chances of survival of the affected patients. The aim of the present study was to evaluate such cytological and stromal changes rendered by the therapy during treatment in breast cancer cases. The present study was conducted over a period of 4 years from January 2014 to June 2017 at Kasturba Medical College, Mangalore, Karnataka, India wherein the clinical and histopathological details were collected for a total of 39 breast carcinoma cases during and post-therapy. Statistical analysis was done using IBM SPSS statistics 17 (Chicago, USA). Various morphological features were analyzed for their frequency and were compared with the final diagnosis using Chi-square value (χ2), paired t-test and Fischer's test. p-value < 0.05 was considered to be statistically significant. The results of the present study revealed that 32 of the 39 breast carcinoma cases changed their grades during the course of therapy (p-value < 0.05). The fundamental manifestation of the effect of therapy was an obvious decrease in tumor cellularity. Intracellular changes commonly noted after chemotherapy included nuclear enlargement, hyperchromasia and an increased N:C ratio which were found in upto 85% of the cases followed by presence of prominent nucleoli and karyorrhexis/karyolysis. The predominant stromal changes seen post-therapy included necrosis (74.4%), fibrosis (64.1%), desmoplasia (59%) and degenerative changes (33.3%). Breast cancer therapy causes morphological alterations in the cancerous as well as the surrounding healthy tissue. The histopathological interpretation in such cases, thus, requires a thorough knowledge of the cytological and stromal changes rendered by the therapy. Abstract: Advances in the treatment of Ewing's sarcoma family of tumors (ESFTs) are a result of improvements in systemic and local therapies. VACA (vincristine, Adriamycin [doxorubicin], cyclophosphamide, dactinomycin) chemotherapy alone versus VACA + IE (VACA with alternate ifosfamide, etoposide) improve survival, but this regimen cannot be given to all patients due to poor tolerance and 5-day schedule chemotherapy in VACA + IE schedule. We reviewed the records of 50 patients treated as per our institutional protocols from 2007 to 2011. Two schedules of chemotherapy followed were vincristine, Adriamycin, cyclophosphamide (VAC) and VAC with alternate ifosfamide, etoposide (VAC + IE). Factors predictive of local failure and distant recurrence were analyzed. A total of 50 patients were analyzed. The median age at diagnosis was 14 years. Thirty-two patients were male, whereas 18 were female. Approximately, 95% of the patients relapsed after a median time gap of 1.6 years. The median 5-year disease-free survival was 30%. Systemic treatment with VAC or VAC + IE–based chemotherapy had equal local control and distant control rates. Smaller tumors had a better local control and lesser systemic failure than those of larger sizes. Successful treatment of Ewing's sarcoma requires optimal systemic and local therapy. Both the chemotherapy regimens showed equal survival rates. Control of both the local and distant diseases is a result of the combined modality approach. Stage at presentation is the most important factor for prognosis. Complete surgery and local radiotherapy are important predictive factors for local and systemic control. Abstract: Burkitt's lymphoma is a high-grade B non-Hodgkin lymphoma (NHL) and rarely presents with jaundice. We discuss the case of a 6-year-old male child presenting with fever, jaundice, and abdominal distention. Computed tomographic (CT) scan of the abdomen revealed a heterogeneous lymph node mass at the pancreatic head with intrahepatic biliary dilation. Serum bilirubin was 26 mg/dL with direct fraction of 12.4 mg/dL. Biopsy and staging confirmed the diagnosis of Burkitt's lymphoma stage 3, group B. In view of hyperbilirubinemia, chemotherapeutic drugs doses were modified and rituximab was added. Persistent jaundice necessitated percutaneous biliary drainage so that chemotherapy could be continued. Despite complete response, jaundice and biliary dilatation remained. Hence, a side-to-side choledochoduodenostomy was performed after which the liver function normalized. Presently the child is well. NHL is a chemosensitive disease. If the serum bilirubin does not normalize quickly, biliary drainage is essential to allow administration of curative chemotherapy and prevent chronic liver damage. Abstract: Primary osteosarcoma arising in breast is a rare form of extra skeletal osteosarcoma, accounting for less than 1% of all breast cancers and 12.5% of sarcomas arising in breast. Fewer than 150 cases of primary osteosarcoma of breast have been reported in the medical literature in the last 50 years. It was reported to have worse outcome compared to typical skeletal osteosarcoma. Osteosarcoma of breast presents in elderly age group unlike skeletal osteosarcoma, which occurs in young people. Diagnosis is by histopathological examination of malignant osteoid and ruling out underlying skeletal involvement. Abstract: Ductal adenocarcinoma of pancreas is the most common pancreatic neoplasm and is the third leading cause of death due to cancer, with a 5-year survival of 8% only. Although pancreatic neoplasms are broadly classified into endocrine and exocrine variety based on cell of origin, on imaging they are classified into solid and cystic types. Pancreatic giant cell tumor (PGCT) is a very uncommon and aggressive pancreatic neoplasm. We report a case of PGCT presenting as a pancreatic tail mass and liver lesions with a morphological overlap with other cystic benign and malignant lesions of pancreas on imaging.